As I begin to recollect my Khao Lak experience, reports of a strong earthquake and a Tsunami warning come flashing in all over the news media. A sense of panic struck. Considering I was there just over a week ago made matters worse. All I hoped for was the damage to be minimal and the tsunami averted. I breathed a sigh of relief once the Tsunami warnings were lifted and reports confirmed that things were under control. The joy of idling away an entire day by the beach knows no bounds. The clock stops ticking. Hunger takes a back seat. It almost feels like every part of your body is on that much needed vacation! We continue our little party at the poolside bar. The poolside bar is one of the best places to hangout in this resort. The cocktails are inviting but the part I enjoyed most was sitting on the bar stools inside the pool. There is something so casual and refreshing about it. On the last day, we spent the afternoon at the ‘White Sand beach’, a 20 min songthaew ride from our Resort. The beach holds true to its name. Although it has its share of tourists, it is still less crowded than the Resort. The shacks at the entrance of this beach where the songthaew dropped us, serves some really authentic and spicy Thai food. Undoubtedly, the best we had in our trip. We concluded our vacation with the last few hours spent at the spa, bringing us to the end of an absolutely gastronomical and rejuvenating retreat. As the old adage goes: a picture is worth a thousand words. 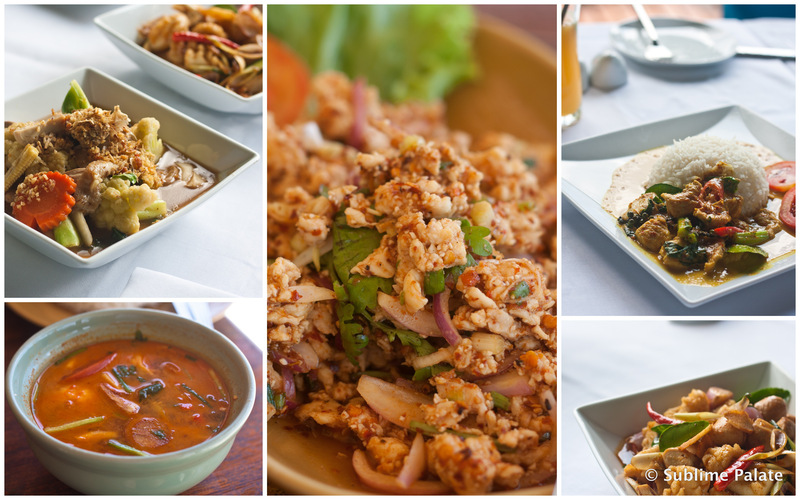 Here is a snapshot of some of the heavenly food we had during our trip. 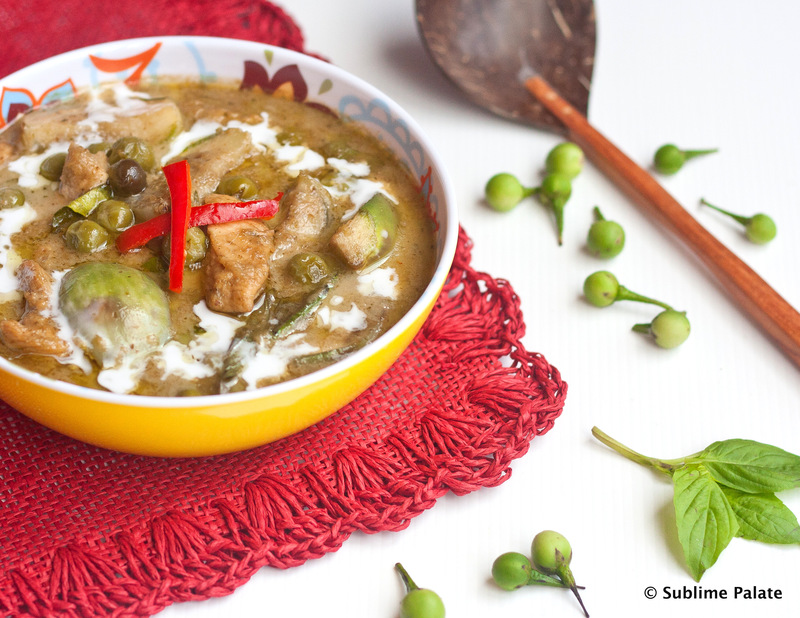 I wouldn’t shy before concluding that Green curry or Kaeng khiao wan is one of the most popular Thai Curries across the world. 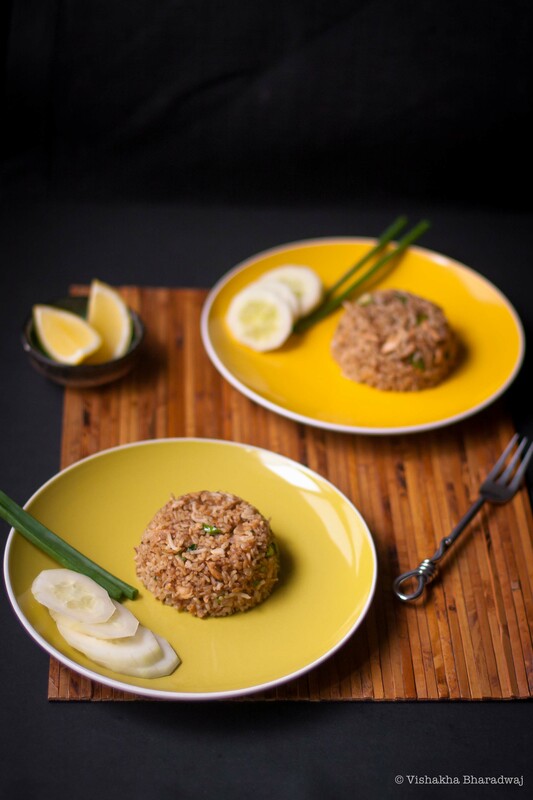 The main reason for such universal appeal, in my opinion, is the ever-so-faithful combination of all the different herbs and spices used to make the Green Curry paste as well as the fact that it is mostly a mild curry. Be forewarned: My version is on the spicy side of the spectrum. Please tone it down by reducing the number of chillies or use less-hot chillies in your Green Curry Paste if you prefer a mild curry. Some restaurants like to add carrots and potatoes in this curry. I am not too big a fan of that in this context. Mine is a simple version with baby eggplants and green round eggplants. You may want to add more vegetables as you like. Baby egg plants: 1/2 cup; Stem removed and washed. Heat oil in a deep bottomed dish. Add the green curry paste and fry for 3 mins on medium-low heat. Next, add 1/2 cup of coconut milk. 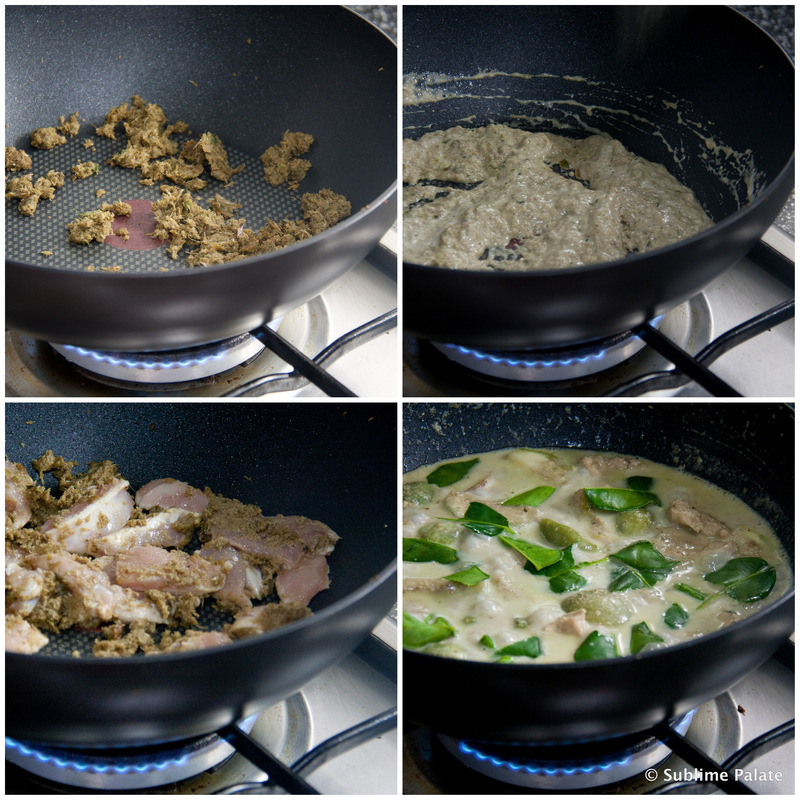 Continue to cook until the coconut milk is almost assimilated into the green curry paste (5 mins). Next add the chicken and fry for 2 mins until the chicken is nicely coated with the curry paste and begins to turn white. Now add the remaining 2 cups of coconut milk. Let it boil on medium heat for about 5 mins. If using coconut cream, use 1 1/2 cups of coconut milk in all. Add 1 cup water. Coconut cream is thick in consistency so adding water helps to achieve the desired consistency. Add the eggplants followed by palm sugar, torn lime leaves, galangal and 1 tbsp of fish sauce. Fish sauce is salty so make sure you taste the curry before adding more. Note: the shrimp paste already has salt. So, if you have added shrimp paste in your green curry paste, do not add too much fish sauce at first. Let it cook for another 5 mins on medium heat. Stir in between. Do not overcook the eggplants as they become too mushy when overcooked. When almost done, check the seasoning. Adjust palm sugar and fish sauce as per your liking. Once done, turn off the heat. Add a handful of sweet basil leaves. Give it a good stir. 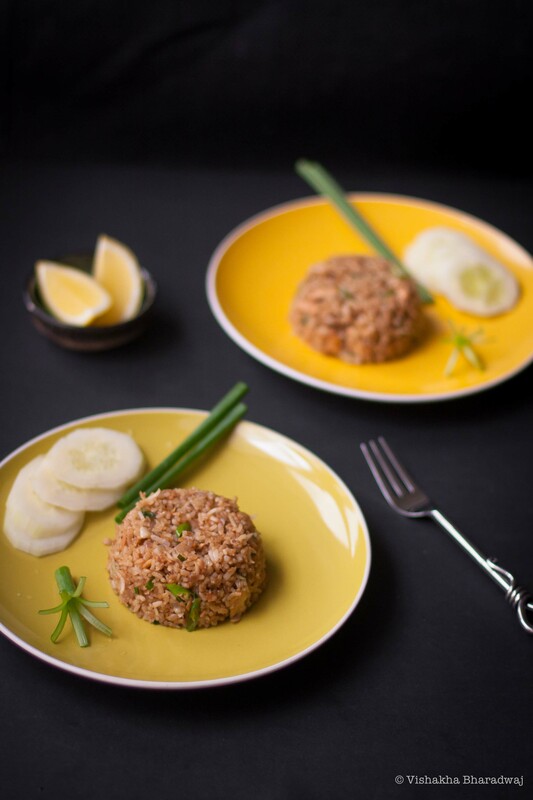 Garnish with a swirl of coconut milk and red chilli strips. 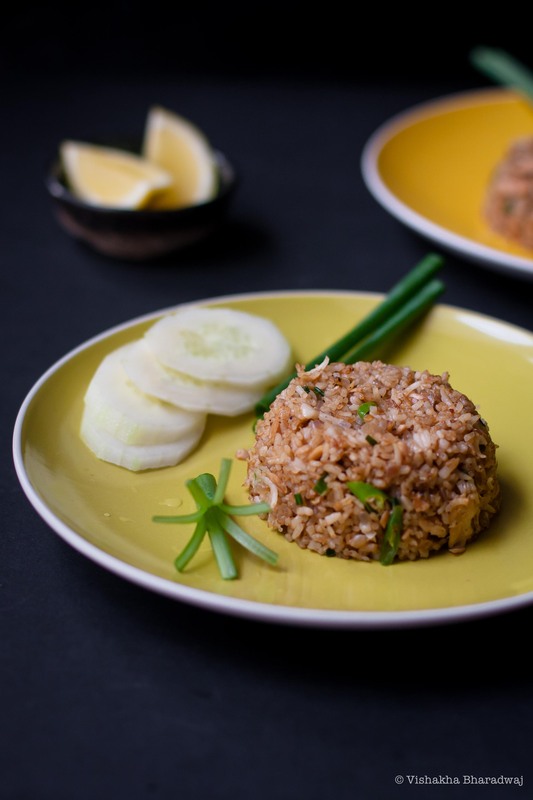 Enjoy with steamed rice. R & I are always looking for reasons to travel. Both of us love traveling but our motivations are different. Yet, one thing unites us : FOOD ! A well-planned but badly executed surprise holiday was in the making. It was R’s birthday last weekend. 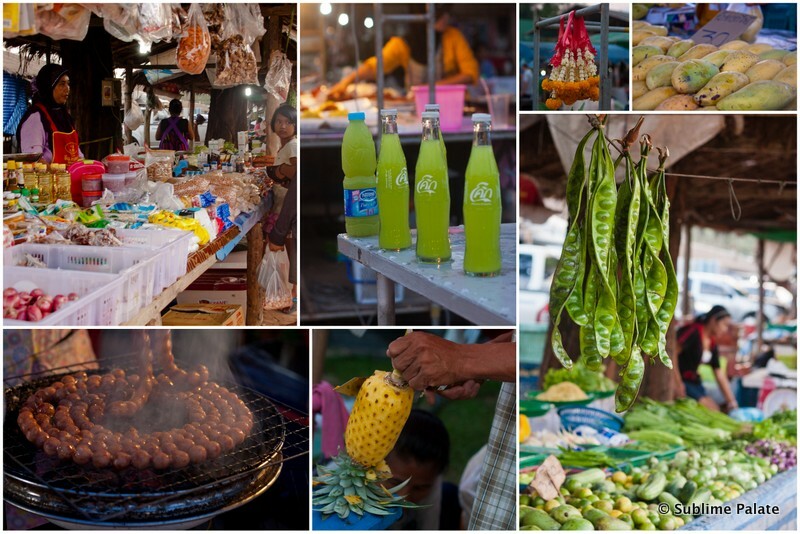 At first, a dear friend spilled the beans – Phuket! I dodged that one somehow because we were going to Khao Lak, 1.5 hours drive from the Phuket airport. And then it was me – a terrible case of ‘slip of tongue’ 😦 So, just before the trip started, R knew exactly where we were going. And I cursed myself for it ! We landed very late that night. A prearranged car and driver was waiting for us at the Phuket airport. In my far-from-perfect-Thai, I explained to the driver that we were hungry! He took us to a small eatery nearby selling Khao Man Gai (Thai Chicken Rice). Khao Man Gai brought back memories of my university days in Bangkok. It was a standard meal for the times when I needed to have a quick lunch in between classes. Lost in nostalgia, I had an extra plate of chicken and two bowls of soup ! 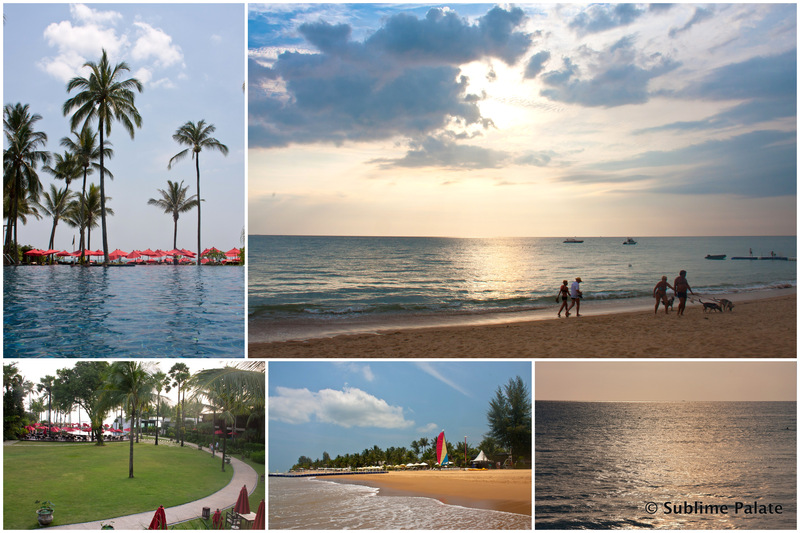 Our resort, Ramada Khao Lak, was a solitude by the beaches far from the madness of Phuket. The room was tastefully furnished with modern fixtures, a fancy jacuzzi indoors and sun-loungers in the balcony – perfect for a romantic vacation. We were here to unwind and soak in every bit of sea, sand and sun. As the sun went down, we strolled to the nearby local weekend market. What better way to experience a place than to shop and eat where the locals do ! One street dedicated to fresh spices and herbs, another to street food and yet another to the 199-Baht clothes and souvenir shops. 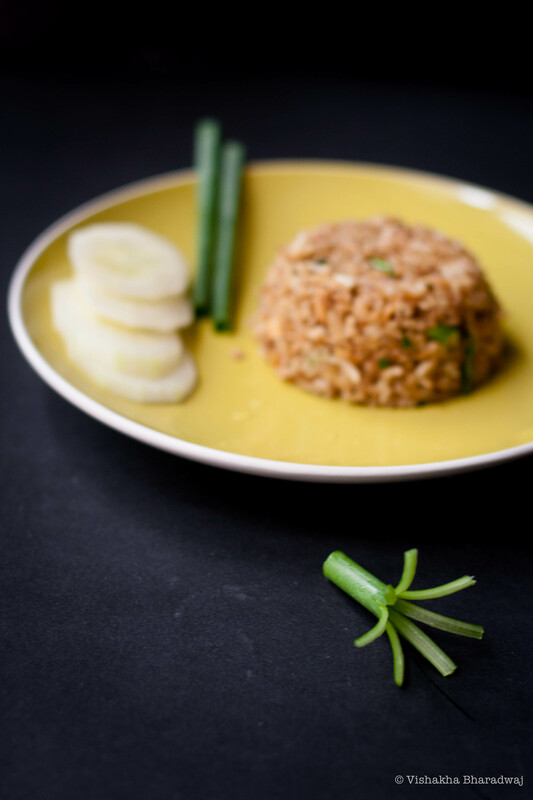 The aroma of fresh basil, mint, coriander, lemon grass, galangal and lime leaves are enough to give anyone hunger pangs! As we just about managed to get past that, the most vibrant, innovative street food awaited us – Smoked pork balls, coconut pancakes, fried chicken, Stick noodles (Phad Thai) and much more! Needless to say, we kept sampling all the food as we walked along. V chose an Angry Bird t-shirt for himself, which by the way he calls ‘bad birds’. Soon our little boy was getting cranky. It was dinner time. We were in the mood for something authentic, and not toned down for ‘foreigners’. A small Thai family restaurant down the road was the unanimous choice. They made a Stir Fried Prawn and Vegetable dish for V – Thai style but without chillies and he loved it! We had our share of everything spicy – fried fish, garlic chicken, stir fried prawns, stir fried vegetables and a yum load of sauces to go with it! A little bit of pampering in the spa was exactly what we needed to end this long and tiring day. More on the vacation in my next post for fear of exceeding the word count limit, if any! 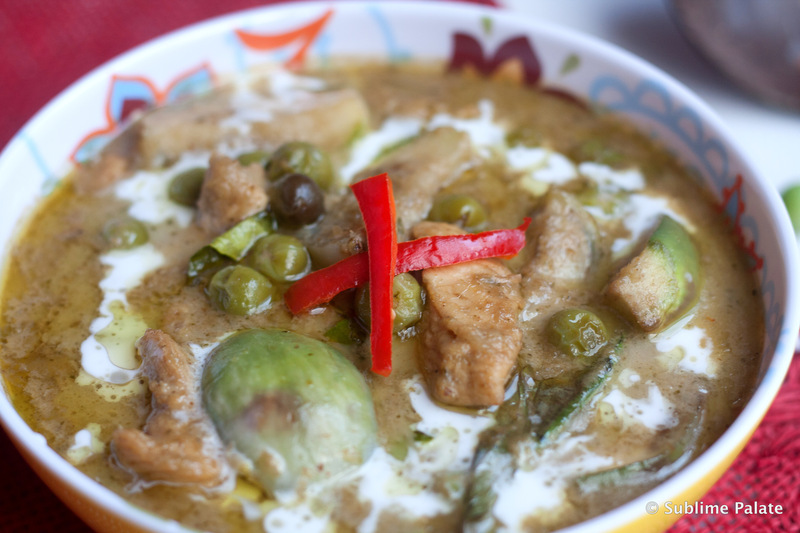 To give myself a continued sense of that perfect beach vacation and to celebrate my love for Thai food, I wanted to share one of my all time favorite curry recipes. I first made the curry paste and then used it to make a curry. I will share the curry recipe in the next post. 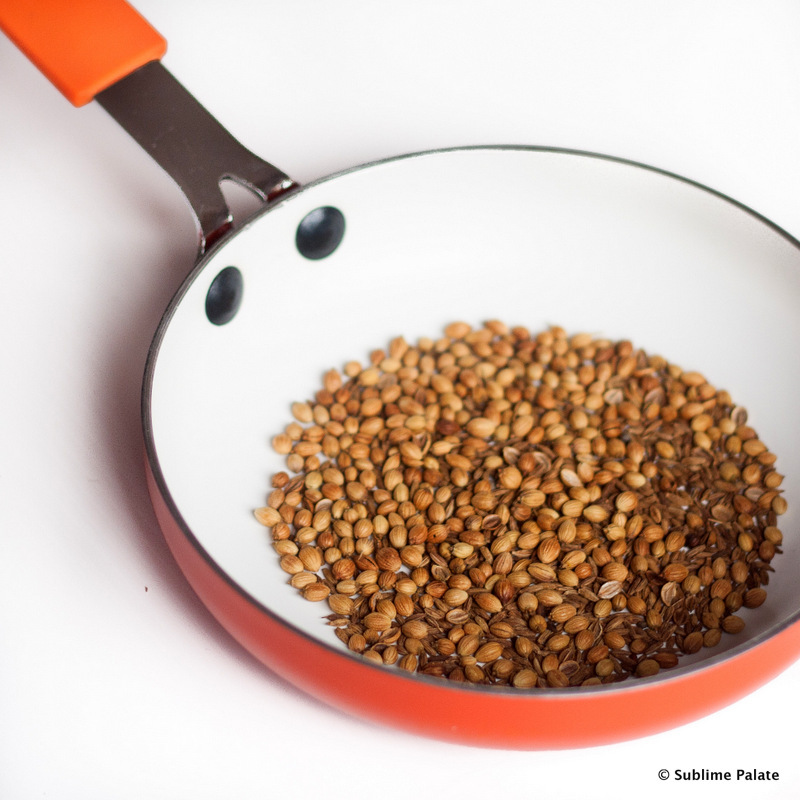 Dry roast the cumin and coriander in a pan on low heat. This may take about 3-4 mins. Let it cool. 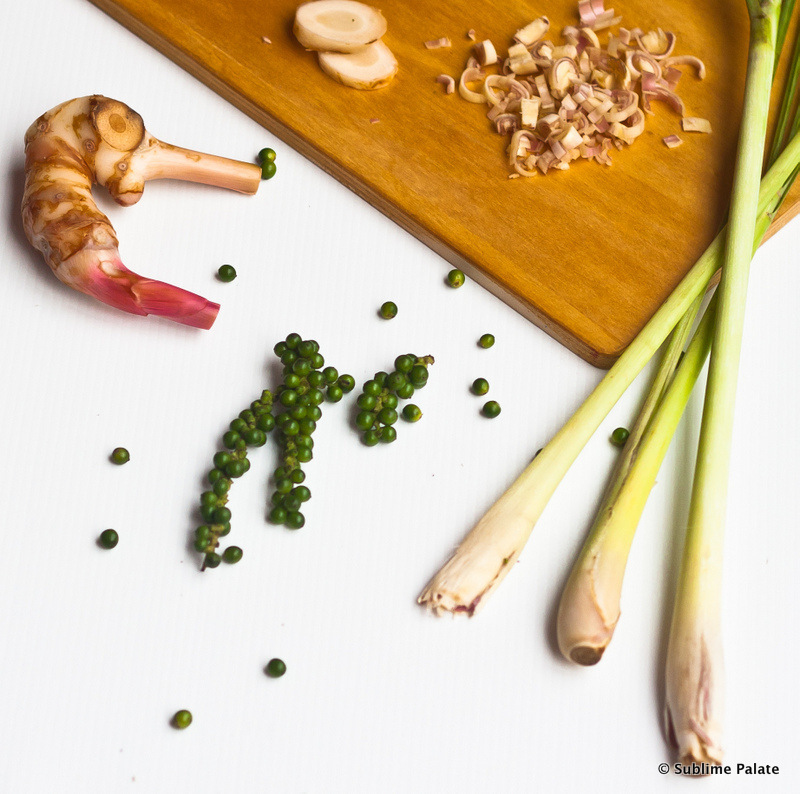 Finely slice the galangal (or Thai ginger) and shallots. Wash the Thai garlic thoroughly. 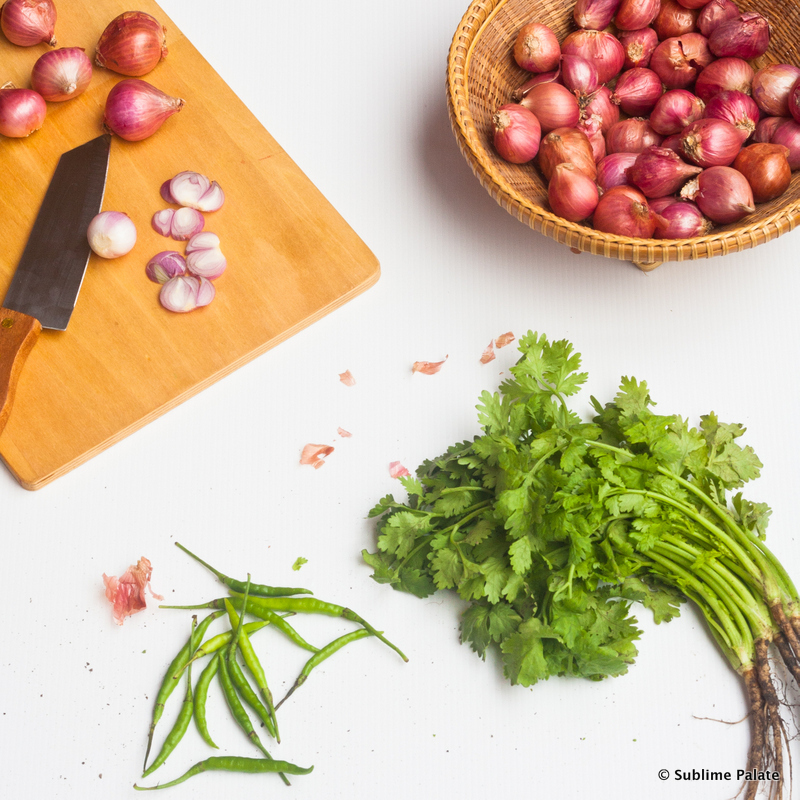 If using Thai garlic, you can keep the skin. If using any other garlic, peel the skin first. 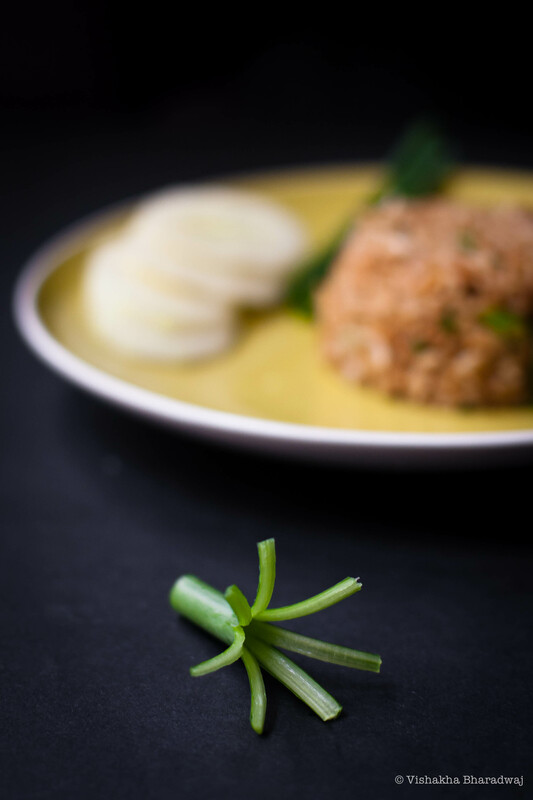 Smash the end of the lemon grass stalk with the back of a knife (white in color). 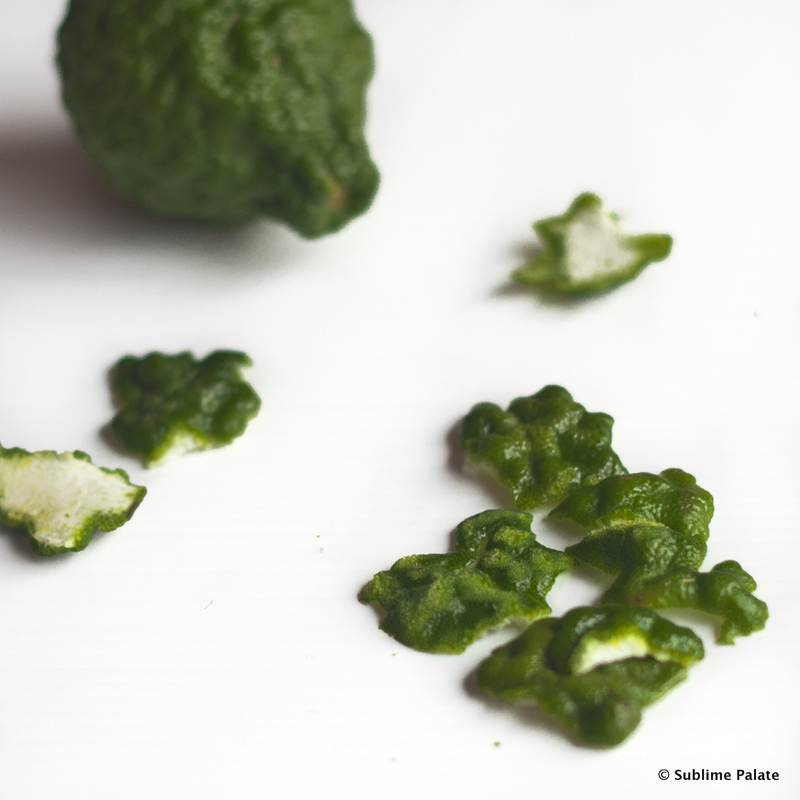 Finely slice the white portion, discarding the green stalk. 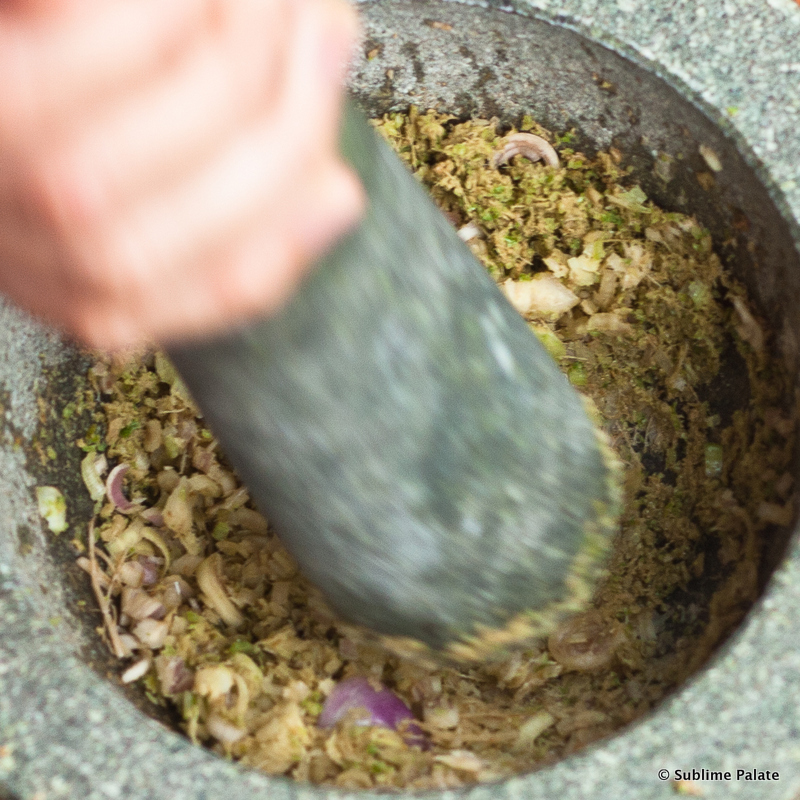 Using a mortar and pestle, finely pound the dry roasted coriander and cumin seeds. Take it out and keep aside in a bowl. Now pound the galangal and kaffir lime rind until smooth. Add the finely sliced lemon grass and green peppercorn and pound. 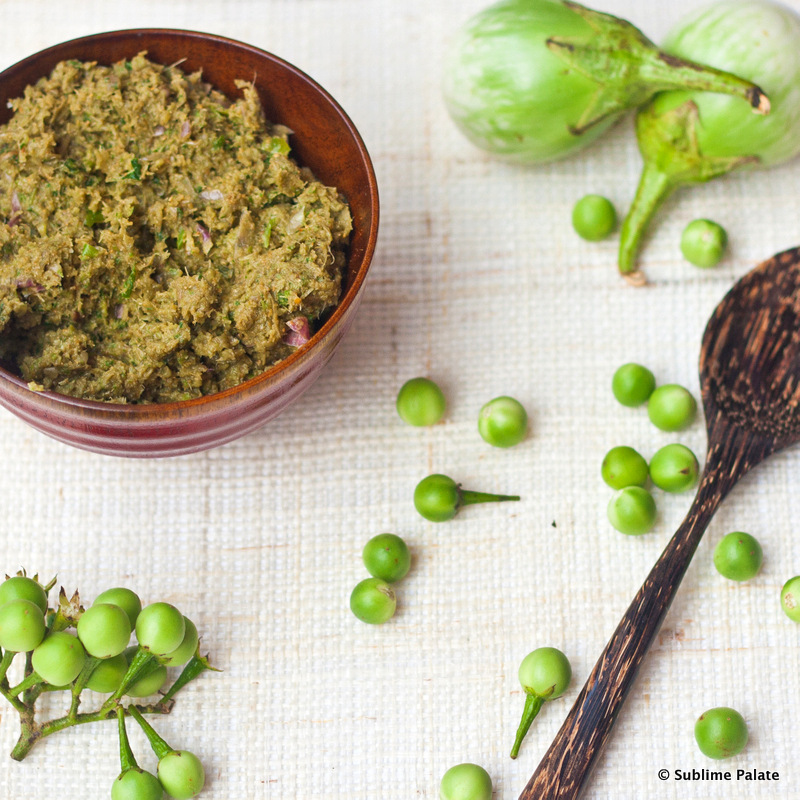 When done, add the green chillies, pound well until a smooth paste is formed. Next add the garlic and shallots and pound thoroughly. 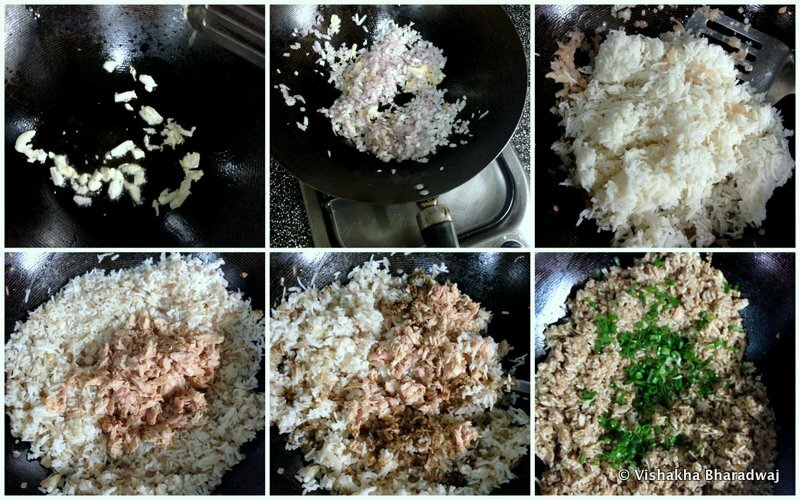 Finally, add the shrimp paste, sweet basil and pound until the mixture forms a fine paste. 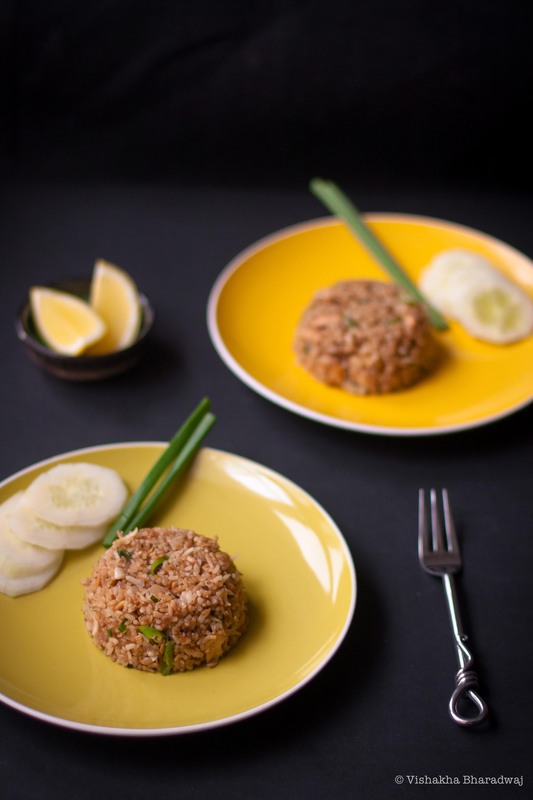 For a vegetarian version, skip the shrimp paste. Alternatively, you could grind all the ingredients in a food processor instead of using the mortar and pestle. Though, I believe that the aromas and flavors that come out in pounding cannot be replicated by a food processor.